Do you create outlines for your books, or make it up as you go? I have discovered there are two basic types of writers: those who outline, and those who fly by the seats of their pants. I’m an outliner. I can’t move forward until I know where I’m going. I usually write the first chapter, just to get a feel for the story and the characters. But then I stop and write a very detailed, scene by scene outline. I generally stick fairly close to the outline as I write. Occasionally bits here and there are added or deleted, but for the most part I keep on the path I’ve built in the outline without much variation. Is it true you got published as the result of winning a writing contest? Yes, that’s true. As soon as I decided to try my hand at writing romance, I joined Romance Writers of America. One of the many benefits they offer unpublished members is the opportunity to enter writing contests that provide valuable feedback from judges — regional contests as well as one important national contest. I won two of the four regional contests I entered, and the winning entries for one of the contests were sent to acquiring editors. Mine was sent to an editor at Berkley/Jove, who wrote me asking for the full manuscript. Minor problem: I didn’t have one yet. I only had nine completed chapters. She asked me to send them to her, and she bought the book based on those few chapters. I realize how extremely fortunate I was to sell my first book without a completed manuscript. I will always be grateful to Judy Stern Palais at Berkley for taking a chance on me and publishing A Proper Companion. Sometimes the name just comes to me. Sometimes I actively search them out. I have several books I use to help me choose names. For first names I use the Wordsworth Dictionary of First Names, as well as Naming Through the Ages, and the Writer’s Digest Character Naming Sourcebook (which was written by author Sherrilyn Kenyon). Main characters generally get simple, common first names. An unusual first name can make a bold statement about a character, and I haven’t yet found a hero or heroine who needed one. I will, though, use an unusual or quirky Dickensian name for a minor charcater. 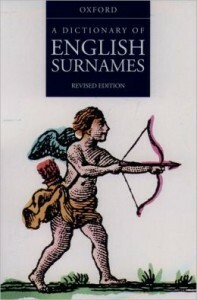 For last names, the resource I most often use is A Dictionary of English Surnames. I try to pick last names that go well with the first names, and also try not to have too many characters whose names begin with the same letter. If I need to name a new character, I look at my character list and then will decide, for example, that I haven’t used a surname beginning with M, so I look up M names and try to find a good one. For titles (eg Lord SoAndSo), I use place name books, since most English titles were/are associated with a place. But I won’t use a county or town name that is well known, like Devonshire or Kent or Bath. Occasionally I will simply make up a title based on no particular place. Like Lord Thayne in Just One of Those Flings. I knew he would be called by his title and I wanted a strong, one-syllable title for him. So I just made it up. Lord Rochdale in Lady Be Bad was a special situation. You can read about how I chose his name on the Behind the Scenes page for that book. Naming is a very serious business for me. I usually set aside a full day at the beginning of a project just for naming characters. I will even make a list of potential minor characters, like the hero’s friends or the heroine’s suitors or the hostesses of balls, etc. That way, when I need a name, I already have a list and just grab one.